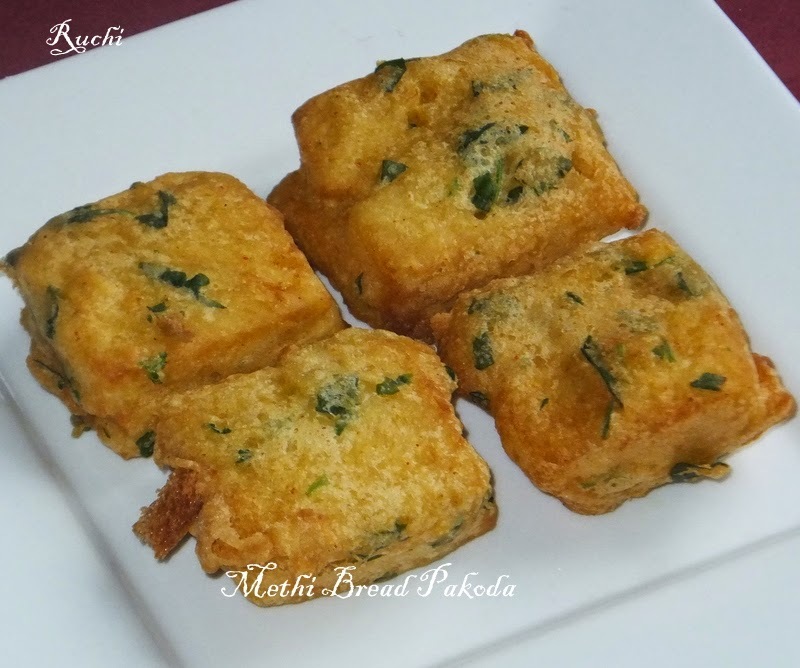 Bread Pakoda is a tasty and luscious snack which is also an easy and simple recipe to prepare.This recipe can be prepared in minutes, using easily available ingredients in our kitchen. And it goes well with tomato ketchup, mint or coriander chutney. 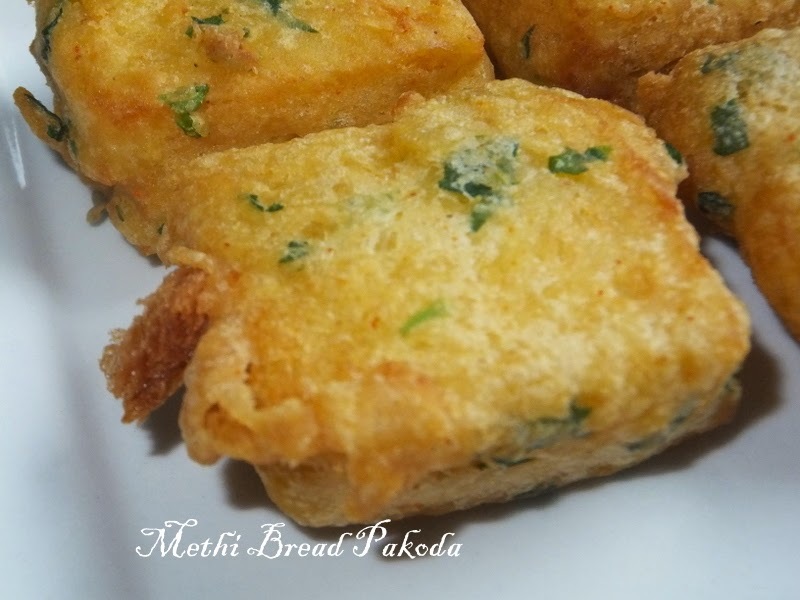 But this wonderful twist with the methi& Cilantro leaves cut and then mixed with the boring bread pieces and coated in plain spicy chickpea flour batter just spruces up and its taste simply enhanced. 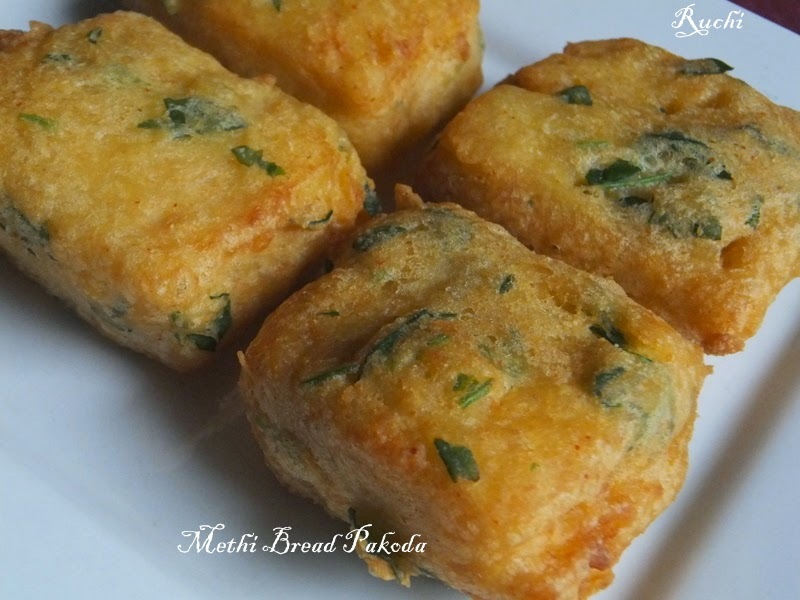 Crisp, spicy and absolutely delicious Methi Bread Pakoda is delicious treats with evening cup of tea/coffee in rainy or winter days. 1. Cut the edges off the bread slices. Slice the pieces to halves/square or triangle as per your choice. Heat oil in a pan. 3. Dip one side of a bread piece into the batter. Make sure the batter along with other ingredients has coated the bread slice well. 4. Overturn and dip the other side of the bread slice.Drop gently in the hot oil. 5. Fry the bread slice each side till crisp on medium flame. Keep it in a kitchen paper to remove excess oil. my daughter liked it very much. will try it.